It never occurred to me that someday he'd be gone. Had Dracula's immortality bled into my perception of Christopher Lee the man? We wanted him to stay forever because Chris never went out of style. He was the one old name who kept punching stardom's ticket for one generation after another. There were the Hammers and Fu Manchus and so forth from 50's through the 60's, then James Bond villainy before a wider audience, support work in high-profilers Airport '77 and 1941 where mainstream audiences found him. Chris was dubbed cool enough to host Saturday Night Live (a 70's equivalent to knighthood?). Then he got work from directors who'd grown up with his evil-doing in theatres. That brought exposure before another generation of fandom ... then another when he ping-ponged from Lord Of The Rings and sequels to the second wave of Star Wars ... and sequels. 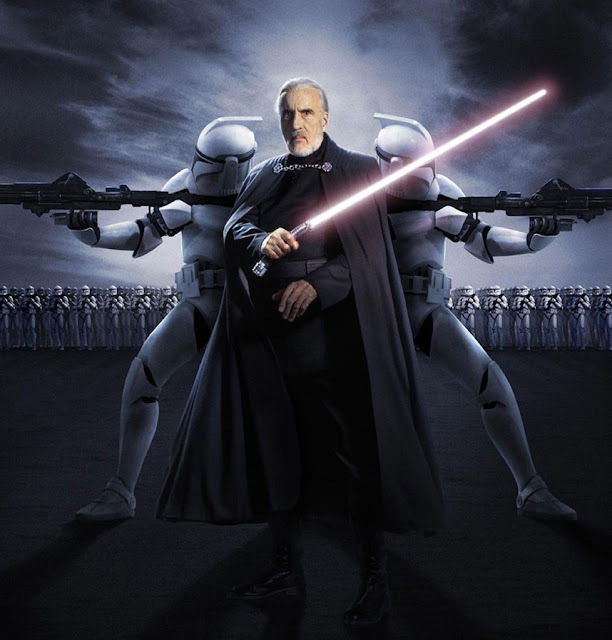 Christopher Lee is the only actor I can think of who could have lived another hundred years and stayed in demand for whole of it. You'd see him from beginnings in British parts. People would be chatting in a manor house, and suddenly this tall and magnetic presence would enter, and all the rest would evaporate. The game would be to see how fast you could say "There's Chris Lee!" before someone else in the room recognized him. It happened most recently for me with Scott Of The Antarctic and The Warriors, the first dated 1948, the next 1955. Polish up your Lee-spotting skills in any number of Brit pix between those dates or before/after, as Chris seemed everywhere, and always to the good of shows that could use his kind of energy. Lee was never afraid to go ahead and be an actor, that is, to show us something and make a thing worth paying attention to. His kind of stature, imposing at the least, called for bravura of a kind that too many "natural" players stayed clear of, maybe for knowing they had not the panache to take screen command and keep it, like him. Lee at times wanted out from under the horror hood. For a while in the 70's, it looked like he'd make it, but somehow he couldn't help being sinister, and a Hammer past would hang on like grim un-death. Not that CL disdained chillers altogether, for he'd champion writers of the genre and apply himself to projects that rose above the formula, like The Devil Rides Out and The Wicker Man. Some who met Lee reported a healthy actor's ego and tendency to dominate a room. Well, what else would you expect, or want? I'd have been disappointed if he'd been any other way. 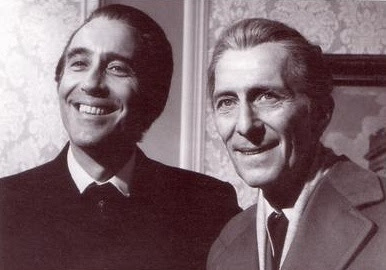 Teamings with Peter Cushing were ideal because they were so different onscreen and off, yet got along famously and had truest friendship as there was between horror icons. The rest of us could figure that if "Saint Peter" liked Chris, he must be a right guy. At least I'll go on assuming it now that they're both gone, and door to meeting either is closed. His homefolk finally knighted the actor a few years ago, and that gave gravitas to everything he'd done or was doing. Sir Christopher became an online familiar and issued Christmas greeting from comfort of hearth, where he also spoke to admirers who couldn't get enough of a legend's career reflection. And yes, Lee liked to talk, and did so for DVD producers, book authors, whatever queue waited upon his door. As to staying current, nobody did that better. Will any of us be performing heavy metal at age 90? Be in continuing demand at age 90 and beyond? (CL was signed to start another picture just prior to his passing) To have lived such a long life so well is worthy example to follow, a good job indeed if we can do it at half Sir Christopher's strength. Christopher Lee" on the packaging. the results are ultimately "meh". I found them on DVD, packed in a "collectible"
tin with an unrelated documentary about Jack the Ripper. Lee played opposite Sammy Davis Jr. in "Poor Devil", a TV movie/sitcom pilot. That SNL episode was one of my favorites with the original cast. You could hear how thrilled the audience was to see Lee in person. In his autobiography, "Million Dollar Movie," the director Michael Powell was recounting the casting of a small part in his film of "The Battle of the River Platte," which was released in America as "The Pursuit of the Graf Spee." His producer brought him a young man, very tall and very dark, with beautiful eyes that were large and expressive. Powell asked him if he could speak Spanish and he could, giving an example of his skills. Then he quoted a line from Heine. He could also speak German. Powell told him that the part hadn't been written yet and would have to be ad-libbed. "Good," said the young man, with impressive assurance. Powell liked him immediately, with that great, deep voice of his and the tremendous presence he had. Only he found that the way he had of giving his complete attention was a little disturbing. 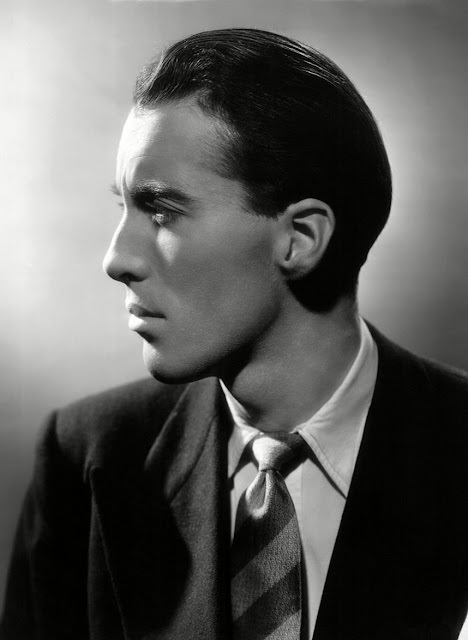 The young man, of course, was Christopher Lee, and he did get the part. A year later, he got another part in a Michael Powell film, but the seven films he made that year, 1957, also included his playing of the Creature in "Curse of Frankenstein." Nothing was the same for him after that. The problem with being typecast, especially if the typecasting is in horror films, is that it diminishes the reputation of the actor as an actor. What he does so well and with seeming effortlessness is not valued, for both the ease of his performance and the genre in which it appears, when those same skills could have also been employed to good effect in other films about other subjects closer to mainstream tastes. In Christopher Lee's case, they were. My son knows little of old movies, save when he has sat by my side, but he knows and loves the Christopher Lee who played Saruman in the "Lord of the Rings" and " Hobbit" movies, a series that found massive acceptance. 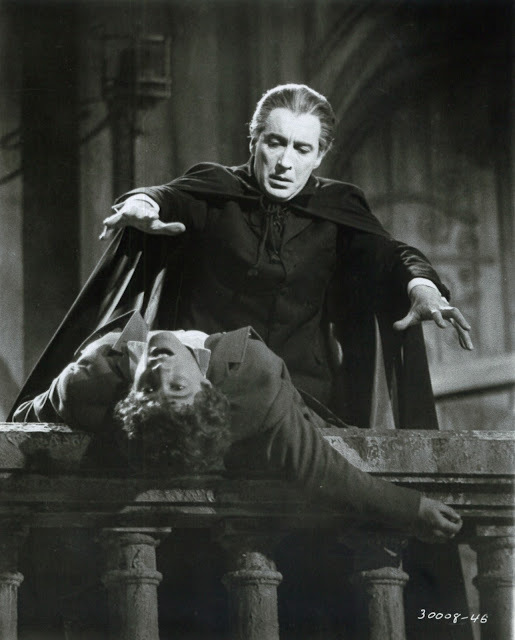 Here was an actor of immense talent, but perhaps this is only to acknowledge why his portrait of Dracula is definitive or why his name will be mentioned with the immortals. Towards the end of his book, when he's remarking upon the great actors and personalities he worked with, such as James Mason and Peter Finch, David Farrar and Dirk Bogarde, Michael Powell remembers Christopher Lee, "the great Christopher Lee, in his masterful performance of a German soldier in "Ill Met by Moonlight," where he dominates every frame of the scene." It is an accolade not often bestowed by the director, but Powell had had the privilege of working with a Christopher Lee while he was only an actor and before the door of his fame had opened. Wonderful tribute to Christopher Lee! With illustrations to suit. I too was pleased to recognize him years ago in rare TV appearances of "Scott of the Antarctic", a movie I happen to like very much myself. (The score by Ralph Vaughn Williams was reworked as his 9th Symphony, I believe---I'm shaky on the number! A wonderfully creepy and effective musical portrayal of the Antarctic's bleak indifference to life itself on this planet, the closest any of us could get I'm guessing to being dropped and abandoned on the moon. Vaughn Williams' female chorus is a kind of wordless Greek chorus which foretells the doom of these proud imperialists.) 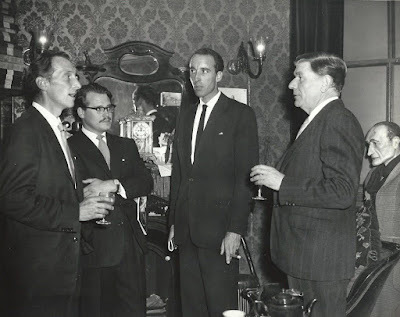 Also, way before the gathering point of the internet which hands out info and clues by the bushel-flu, back in the '60s I remember being tickled to recognize not only Chris Lee in John Huston's sweet and sad "Moulin Rouge", but later in the film also his future screen-mate Peter Cushing! (Cushing at least has LINES.) Then I assume you've observed Lee, also mute for the most part, in the delightful Burt Lancaster picture filmed in Europe, "The Crimson Pirate", as a soldier of the corrupt king...? That movie's absolutely great-looking even on DVD w/ Otto Heller's Technicolor photography coming off splendidly. Torin Thatcher's a wonderful especially-wicked pirate in Capt. Lancaster's scurvy crew. This was a huge favorite when it would appear on the format 'Million Dollar Movie', where it would play five nights a week. (This, and "The Flame and the Arrow", filmed in the simulated Europe of Calabasas, Agoura, and WB's backlot!) With the encouragement of seeing WB having scheduled "Mighty Joe Young", "Son of Kong", "Them!" and "The Beast From 20,000 Fathoms" in an HD gathering, I hope they may issue the Burt Lancaster goodies in a Blu-ray box, too, one day, possibly including things like "Jim Thorpe: All-American" (a classic glossy Hollywood bio brilliantly directed by Michael Curtiz with a great score by Max Steiner---in both cases, merely stating the obvious!) and the weak link, "South Seas Woman", a lame 'comedy'---though "His Majesty O'Keefe" would be the much-better choice. While I'm 'here', I also liked your review of "Night Has a Thousand Eyes"! Another film I used to see occasionally on TV as a kid and loved every minute of. You're right, it absolutely had the scary allure of a horror movie. This and another one featuring Robinson, "Flesh and Fantasy", were fascinating and oddball creatures of '40s cinema that always made a surprising and unique impression when they aired on TV back then. TCM ran "The Crimson Pirate" a few weeks ago in TRUE HD, and it looked great. Somewhere I heard there was an ownership issue with regard video release of the film, and this was now keeping it out-of-print after the fairly long-ago disc came and went, so as to an eventual Blu-Ray, who knows? I love all of Christopher Lee's films and also Peter Cushings, such great actors, I cried bitterly when Peter died and heavily for Christopher, I have supported/followed them since 1958, and horror films will never be the same. R I P Christopher and Peter and if you are in heaven I shall when its my turn to look out for you both. I shall never ever forget you both, your kindness and generousity is awesome. if anyone has not heard Christopher see they ought to as he has a marvellous bass Baritone voice.